Dexter has been crowned Pet Survivor of the Year! Dexter was deliberately shot in the face. 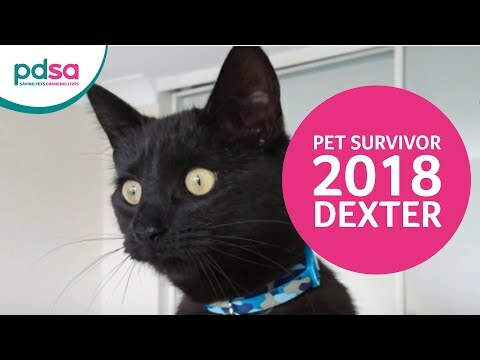 Poor Dexter was left at death's door after suffering a horrific airgun wound, but now he's been crowned as PDSA Pet Survivor of the Year 2018. Cheeky Dexter had a rough start in life; he went through several homes and was put up for sale online before ending up at the National Animal Welfare Trust. At eight months old he finally found his forever home with the Lewis family, who very quickly fell in love with this confident chap. One night Dexter didn’t come home as usual, at first his owners weren’t unduly concerned, but when he failed to arrive for breakfast the next day they became worried. He was nowhere to be found, but later that day a cry was heard in the lounge - it was Dexter. Relief quickly turned to horror at what they found – he was covered in blood, icy cold, struggling to breathe, and his leg was at an odd angle. Living in a rural area, they initially suspected he’d been mauled by a fox or badger, and he was wrapped in a blanket and rushed to the vets. Ruth thought he would die in her arms. Once stabilised at Animal Vet Services, x-rays revealed the horrific truth - Dexter had been deliberately shot through the roof of his mouth, possibly with an airgun. His jaw was fractured and an exit wound was visible at the back of his neck, while other pieces of metal ’shrapnel’ were left through his head and neck. He wasn’t even able to walk, so how he’d dragged himself home was a mystery. He stayed at the vets for several days but his owners were warned it was touch-and-go, and even if he survived he may never regain full use of his legs. He had a fixator attached to his jaw for 5 weeks, meaning his owners had to hand feed him several times a day. He had to be kept in on cage rest, which was very challenging for a usually lively and energetic cat. It was a long road to recovery, but three months on you wouldn’t even know anything had happened. The only remnant of Dexter’s terrifying ordeal is the remains of the hole in the roof of his mouth, which is yet to fully heal, and may require one final surgery. It means he slurps when his drinks, but nobody minds - he’s a little miracle cat!